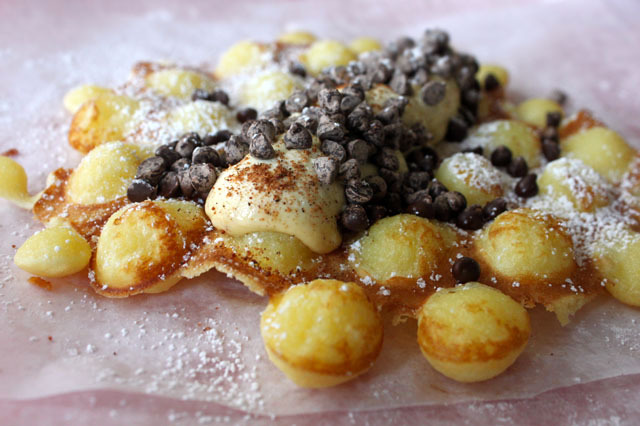 I love the idea of eating a waffle on the street. Earlier this year when my sister got an eggette pan from her husband, I learned that egg waffles are traditionally served on the street in Hong Kong! We like to enjoy them around the dinner table here, pulling the little circles apart and piecing at the sweet custardy bread with friends and family. 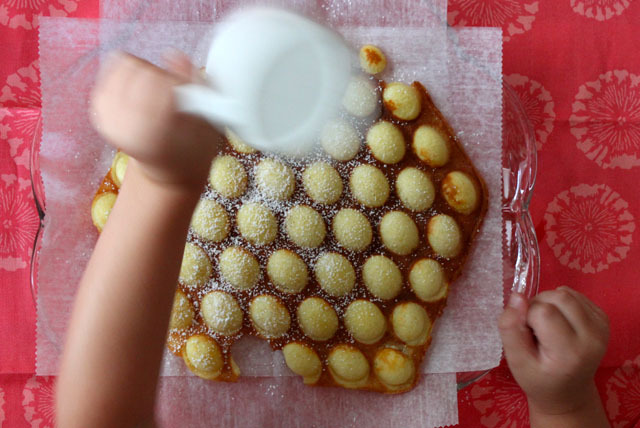 My niece calls them Octopus Waffles and likes them with powdered sugar; I call them Bubble Wrap Waffles and like them with cinnamon sugar; my sister usually makes the waffles and likes hers with whipped cream and berries. 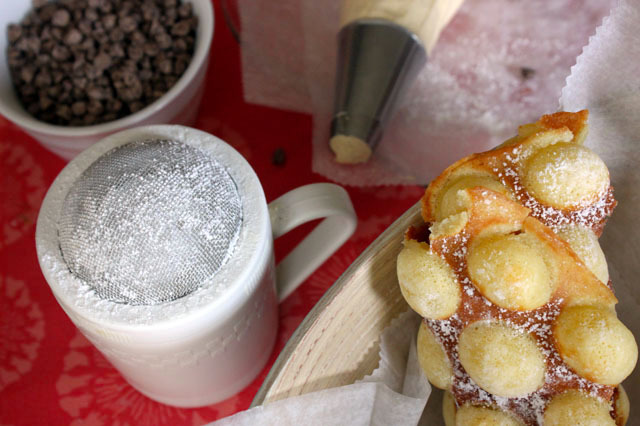 This day we three got in the kitchen and made a rich cannoli and falltime inspired egg waffle. The recipe is from the egg waffle pan, and the pumpkin spice cream filling recipe below is adapted from a JELL-O advertisement I once tore out of a magazine. 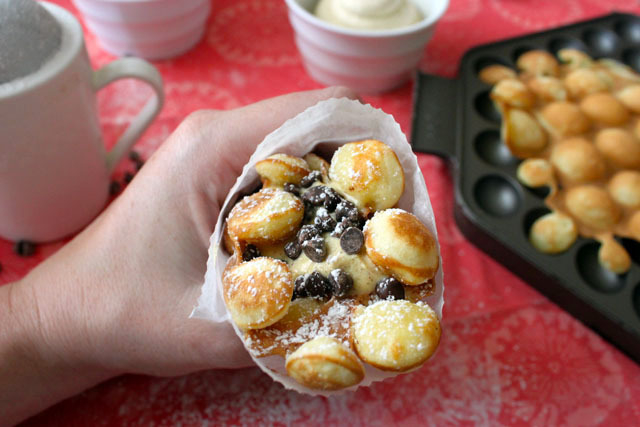 Sprinkled with chocolate chips and wrapped up, it’s a breakfast dessert that’s good on the go! If you don’t have an icing bag, just dollop it on with a spoon. 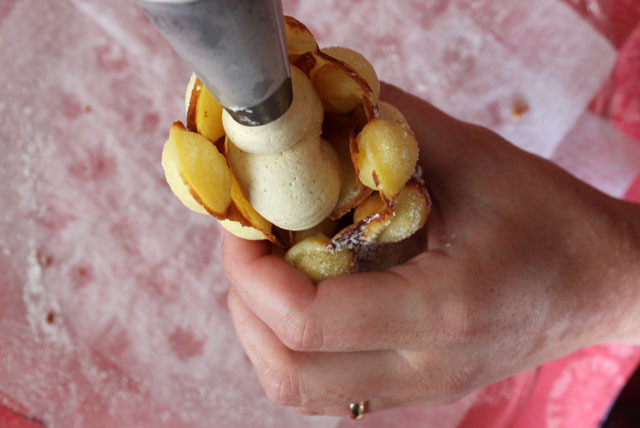 It also works wonderfully in donut holes or spread between cake layers. i have never seen such a thing! Well that’s new. Now these “egg stuffed waffles” are they actually stuffed with something, are they just air pockets, or just little mounds? ha 🙂 they are mounds… a little spongy and very tasty. Where did your sister get such a pan? Those look fantastic! ok, that’s it. I need an octopus waffle pan. These look amazing Amy! You do; octopus waffles are so fun and tasty 🙂 Thanks!